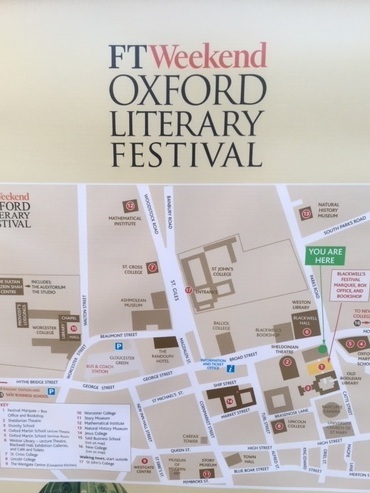 Today, I enjoyed the beautiful spring sunshine in Oxford for the festival. Last year, I drove through snow to get here; this year, it was fog, but by the time I arrived it was a lovely day. I spent some very happy time in Blackwell’s which I absolutely adore. No book was left unturned in my quest to add to the amazing selection of suggestions we already have for this year’s awards. The staff were so lovely and friendly and the time flew by! My first event was at St Cross College where David Fickling, Dan Freedman and Candy Gourlay were discussing what makes a great children’s book. The setting was lovely- the college courtyard looking beautiful in the sunshine. David Fickling is one of the most inspirational, enthusiastic people I think I have ever had the pleasure of listening to. His passion for good stories and his pride in his ‘village’ of a publishing house was infectious and no one could doubt the warmth and mutual respect between him and his authors. Dan Freedman explained how he had never really seen the point of writing until he realised that he could make a career of watching sport and writing about it as a sport journalist. The led eventually to his writing his Jamie Johnson books, a hugely popular football based series. He then spoke about his new book, published by David Fickling, called ‘Unstoppable’. Focusing on twins with very different sporting dreams , it is a gripping read which follows the many obstacles and complications which they face. Dan read two short extracts, one focusing on each twin. ‘Unstoppable’ will be reviewed very soon. Candy Gourlay was completely captivating as she spoke about her childhood in the Philippines and how she came to reading and then to writing. Her latest novel, ‘Bone Talk’ has just been shortlisted for the Carnegie award and she explained how she had come to write about the Bontoc people and the American invasion of the Philippines. Candy was fascinating to listen to and ‘Bone Talk’ is a must read which I reviewed for Reading Zone a while ago. I will post my review here soon. It was a fascinating session for everyone! 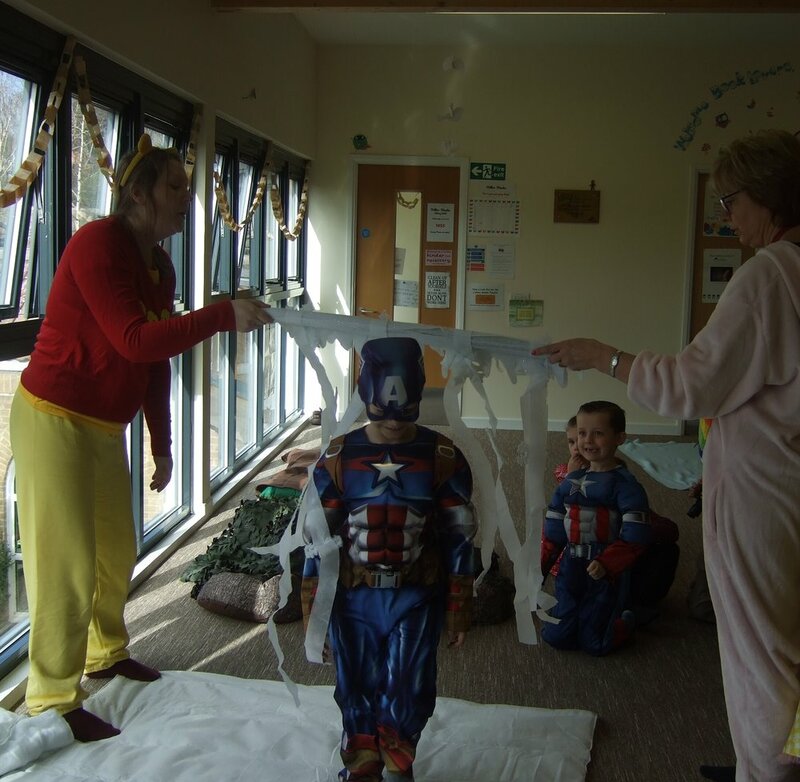 News from another of our schools about how they spent World Book Day. Many thanks to Tracy! 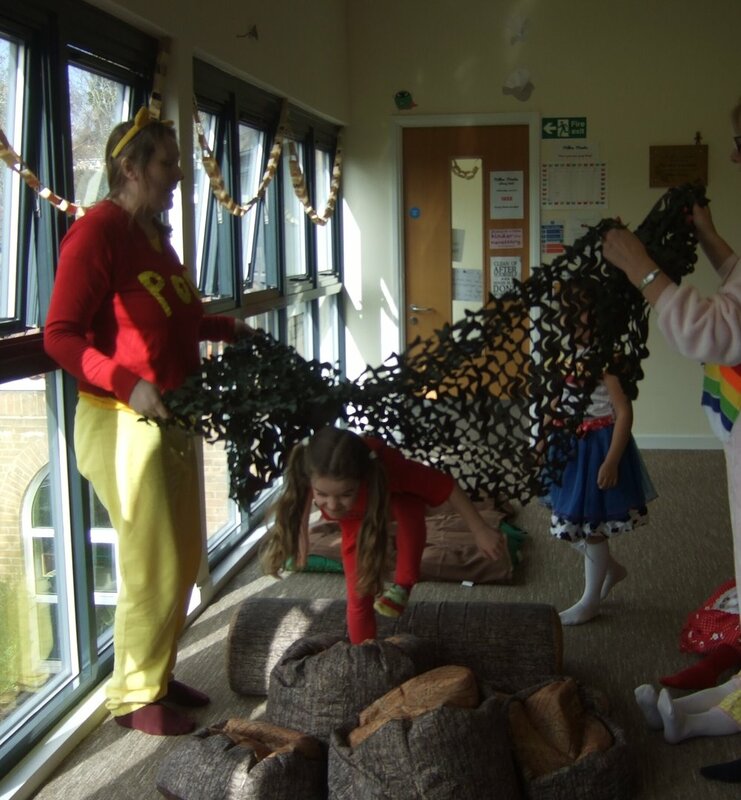 World Book Day 2019 saw our school celebrate the 30th ‘bookaversary’ of the classic and wonderful ‘We’re Going on a Bear Hunt’ by Michael Rosen and Helen Oxenbury. Our library had transformed into a ‘Bear Hunting’ zone complete with all the obstacles the mighty bear hunters face in the story. 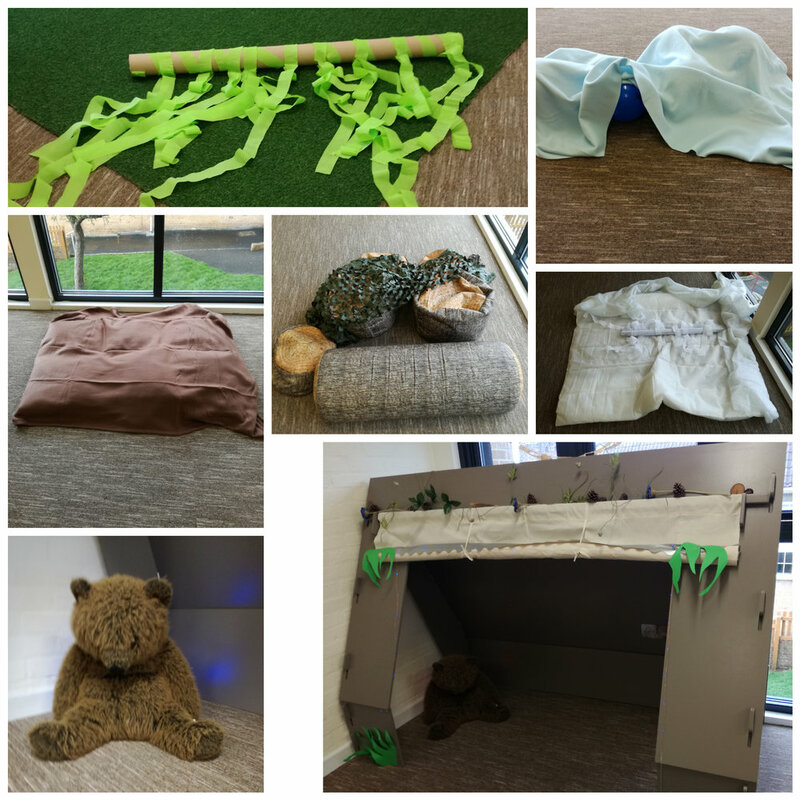 There was grass, a river, mud, forest,snowstorm and cave all created out of junk, blankets, balloons,cushions, camo nets, duvets and our everyday library furnishings. It was made interactive by some adult ‘wafting’ and enthusiasm and of course,the vital ingredient of ‘imagination’- which our small bear hunt participants duly switched on by tweaking their ears before we began. In the spirit of the ‘Share a Story’ theme of this years World Book Day, our Bear Hunt was ‘call and response’ with initial quiet, uncertain voices turning into giant, excited, giggles as we progressed through our hunt -repeating with enthusiasm the familiar refrains and joining in with gusto the necessary ‘Swishy Swashy, Splish Splosh, Squelch Squerch, Stumble Trip, HoooWoo, TipToe’ to accompany our obstacles. The crescendo was of course our ’Bear’. By then our children were so completely absorbed in the story book world that our average ‘Ted’ became our frightening quarry and the ‘quick’ return journey home was quite exhilarating. Our library walls positively shook with the voices and laughter of thrilled little and big bear hunters as they realised they had ‘Forgot to close the door!’ and the smiles and twinkly eyes of the little faces peeking out of covers to announce full heartedly ‘WE’RE NOT GOING ON A BEAR HUNT AGAIN!’ was one of those priceless moments of working with children when you realise, just for an instant, how so very small and innocent they really are. Over 200 KS1 children took part in a Bear Hunt that day and each hunt had something ‘magic’ about it - from the little girls who, dressed as Princesses, lifted skirts to avoid muddy hems in the ‘Mud’ to the boys who ‘swam’ through the wafting ‘river’ and exclaimed that in the ‘snowstorm’ they had ‘Really walked on ice!’ (it IS quite surprising how slippery an uncovered duvet can be!). The day positively flew by! The magic lingers a little still - with the smaller children still viewing our now ordinary Teddy with some trepidation! Seeing teachers interact with their pupils in an imaginary world is not something the curriculum allows on a daily basis so it is lovely that World Book Day exists and that the amazing ‘We’re Going on a Bear Hunt’ could give our pupils and staff that 10 or so minutes of opportunity to make a memory of a happy school day and of course - feel the power of a really great story! Duncan Beedie's Mendip Moon Mission! Today, the wonderful Duncan Beedie visited school to judge the ‘Reading Rocks’ competition which we held as part of our World Book Day celebrations. Everyone was very excited! We had some wonderful entries to our competition. Having an illustrator as a judge really inspired the children and they could not wait to find out who had been chosen for each year group. Everyone who chose to enter received a certificate and the one Duncan chose from each year group would be able to choose one of his books which he would sign for them. Duncan led two assemblies- one for EYFS and KS1 and one for KS2. Announcing the winners, he praised all the entries and said how impressed he was by their quality. He explained why he had made his choices and the children were delighted! After play, Duncan spoke to our KS1 and EYFS children, delighting them by appearing in his spacesuit! They were very excited and love the story about Molly and her moon mission. Duncan showed them how to draw her and the results were amazing! Such concentration! An author/illustrator visit has such an impact on children- it’s an absolute joy to see! Whether it encourages them to borrow a book from the library, draw some pictures, read a story or talk to their friends and family about what they have seen, it is such a worthwhile experience. Thank you so much to Duncan for agreeing to come and join us and to Alistair from Books on the Hill for coming and selling books. What a wonderful way to continue our WBD celebrations! More to come on Monday with Sam Gayton! You can read our review of Molly’s Moon Mission here. You can read our review of The Last Chip here.